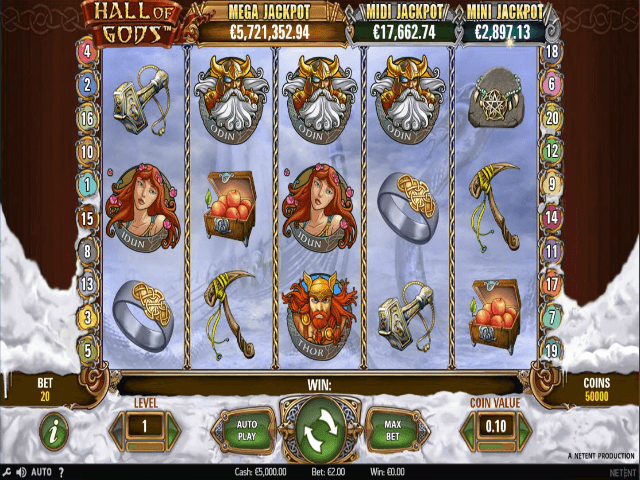 One of the most popular slots online at the moment, Hall of Gods takes its inspiration from classic Norse mythology. Developed by Swedish gaming giant Net Entertainment, the progressive slot is available for play at a number of online casinos. Play Hall of Gods For Free! 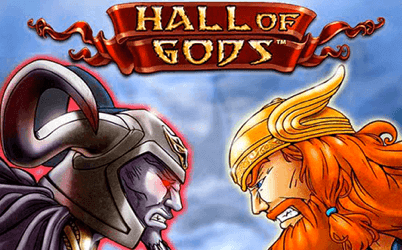 As one of the most popular slots online at the moment, Hall of Gods takes its inspiration from classic Norse mythology. The progressive slot has been developed by Swedish gaming giant NetEnt and is available for play at a number of online casinos. Are you curious to find out why this video slot has earned its rightful success? Make sure to read on. The Hall of Gods slot features five reels and 20 paylines, with a high theoretic pay-out rate of a whopping 96.5%. The icons on the reel feature familiar Norse Gods such as Thor, his one-eyed father Odin, and his other son, Thor's mischievous brother Loki. The game also features the Goddess Freya, who represents love and fertility, as well as war and death, and Idun, Goddess of spring and rejuvenation. In line with the overall theme, the game also utilises other typical Nordic symbols such as a wedding band, a necklace with a pentagram, a treasure box of apples, and weapons such as a scythe and Thor’s mighty hammer, Mjolnir. Players can spin the reels in exchange for a minimum bet of 0.20p or can go big by betting the maximum of £50 per spin. Constantly betting the same amount can be made a lot easier by opting to use the handy auto play feature that goes up to 1000 spins. If you’re not willing to stake too much money, but would still like to make use of the auto play feature, you can choose a lower amount of auto spins or to automatically stop the feature on any win, a Free Spins or Bonus Game win, or if your cash decreases or increases by your chosen amount. The progressive jackpot can be accessed via thee levels – Mini, Midi, and Mega, with the latter being the highest. In order to win the jackpot, players must unearth the bonus game by landing three bonus symbol, which is Thor’s hammer, anywhere over the maximum 20 paylines. Players then wield the hammer to break a shield and match the cash prizes to claim them. In addition to this, there are Wild symbols, the Midgard serpent Jormungandr, which can expand over reels two, three, and four to increase your winnings. The game also regularly awards Free Spins, when three or more scatter symbols (Odin’s ravens, Huginn and Muginn) appear. All wins during the free spins are trebled. Since its release in 2012, the highest recorded win on Hall of Gods mega jackpot was £7,673,975. The average win for the mega jackpot is just over £5.5 million. The biggest jackpot won on the Midi level was £270,575, while further down at the Mini level it was just over £8,000. Is the next big win going to be yours?